Origins Summer Program has begun! Home|Origins Summer Program has begun! 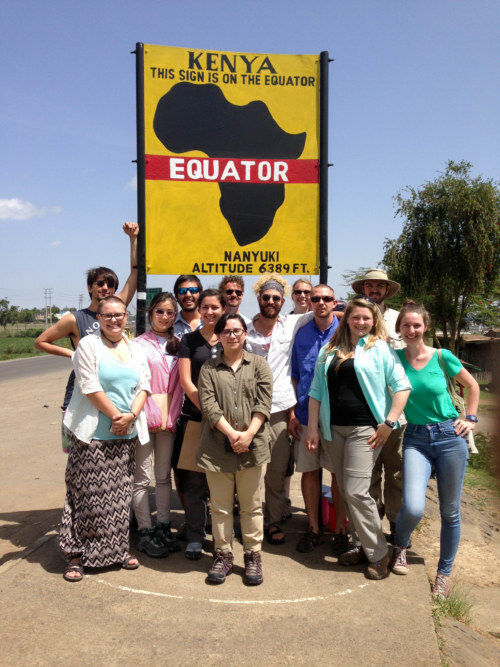 On Sunday, June 4th, our group of students arrived in Nairobi after their flights from the USA and Australia. With their arrival, the 6-week long TBI Origins Summer Field School has officially begun! 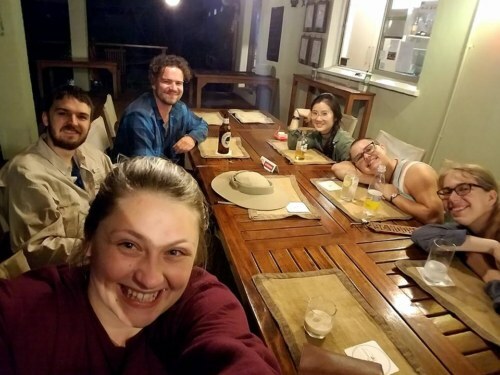 We all traveled to the Wildebeest Ecolodge just outside of Nairobi, where we were welcomed with our first round of Kenyan tea and cookies, and a very friendly golden retriever. After tea, we all settled into our tents and spent some time by the pool. Over dinner, we got to know each other some more. 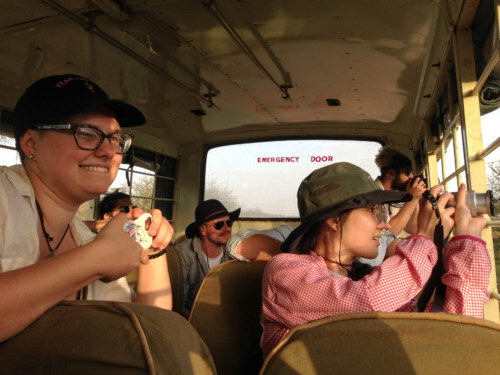 After our first night in Kenya and an early breakfast, we all piled into two large vans and started our drive up north to Mpala, the nature reserve where we would spend the first half of the Environments, Ecosystems, and Evolution module. 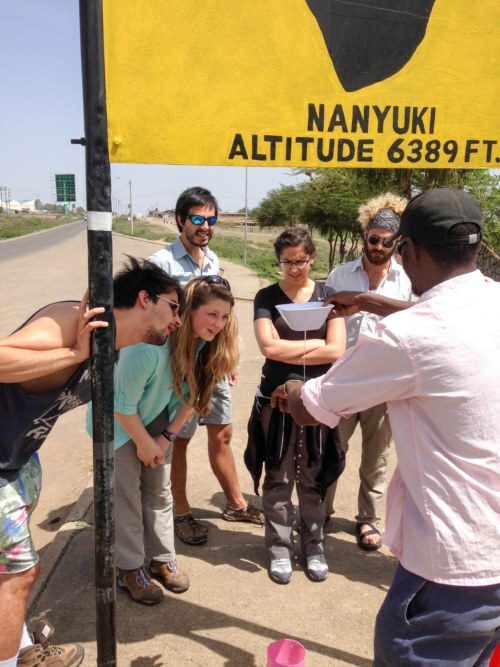 Halfway through our drive we crossed the equator near the town of Nanyuki. Here we stopped for a bit to stretch our legs and enjoy a demonstration of the Coriolis Effect (caused by the earth’s rotation). We started our demonstration a little South of the equator, where a guide showed us that when water in a bowl drains through a little hole in the center it will do so with a clockwise swirl. When we walked to the northern side of the equator, the draining water created a counterclockwise swirl. Finally, when water was drained at the equator, no swirl appeared, and water drained straight down the tiny hole in the bowl. Science in action! When we entered the grounds of the nature reserve near the Mpala Research Center, we kept our eyes peeled for Kenyan wildlife. 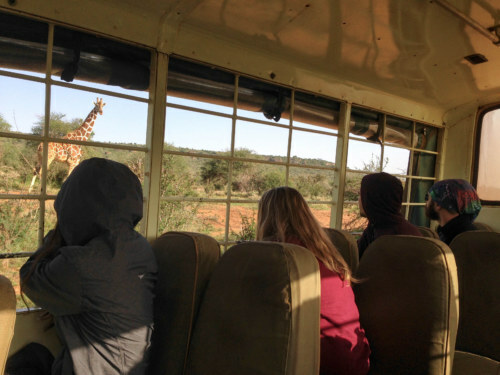 We saw a wide range of animals: giraffes, zebras, elephants, and a lot of dik-diks! 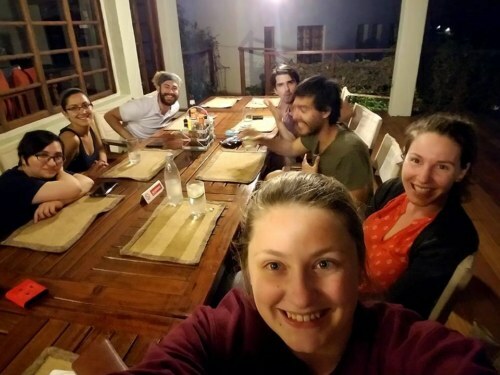 We arrived at the River Camp just before dark, and enjoyed a lovely dinner before settling into our tents, where we would be staying for the coming four nights. Before going to bed, we sat around the campfire, which would become our nightly ritual for our time at Mpala. 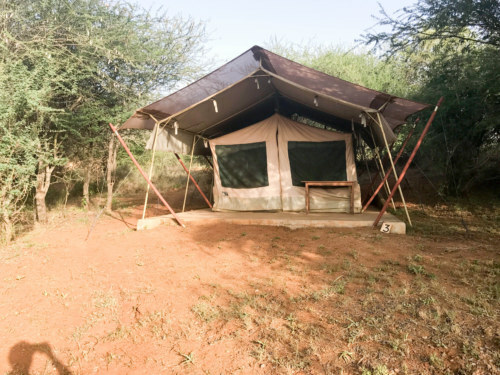 All our tents were located right next to the river, which has a lot of wildlife activity during the night. The wildlife is separated from us by electric wired-fences, but the sounds we heard during the night kept us updated on all the animals roaming around the river while the sun was down. The main reason for coming to Mpala is that it offers amazing opportunities for studying African ecology in a protected wildlife environment. 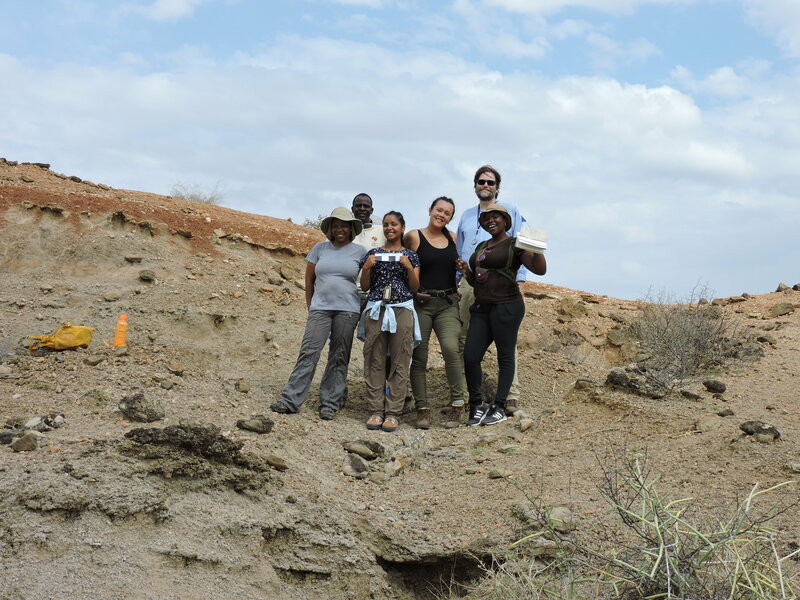 The Mpala Research Center is the base for a large team of international researchers that study a wide variety of topics. Examples include parasites, insects, baboons, and guinea fowl. 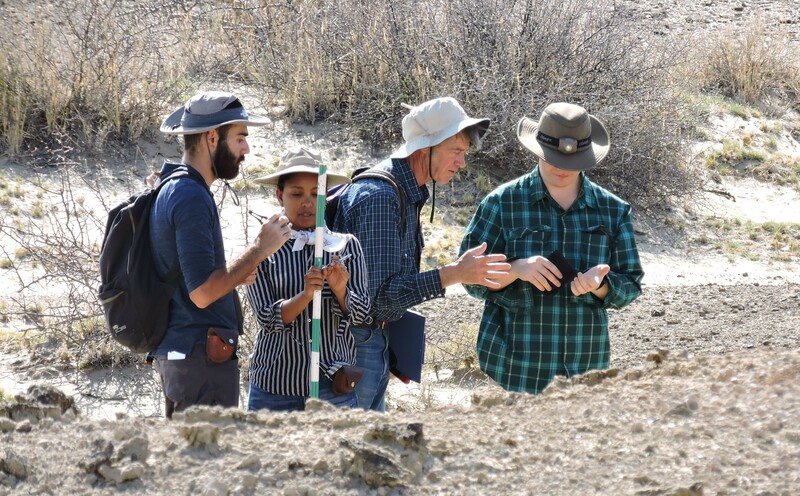 In the coming days, our students will get a chance to learn first-hand from these researchers what it is they are doing here at Mpala, as well as get the chance to participate in their fieldwork. On our first day at Mpala we started with a 6AM game drive. We saw some amazing animals before having breakfast at the River Camp. 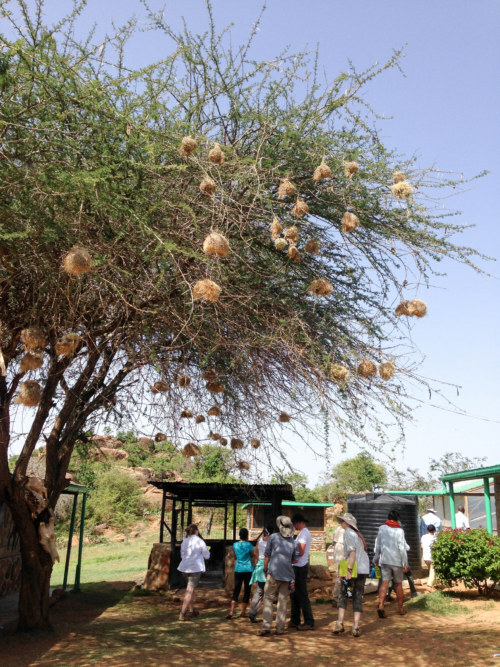 We spent our day learning more about what happens at the Mpala Research Center and visited a primary school that is located within the reserve. This is where the children of all the park rangers are educated, and conservation is a major part of their curriculum. From the school grounds we could see the elephants and zebras exploring the hill sides. We joined the children in a lesson on the shapes and functions of grass, and finished our visit with a game before all the children went home and we returned to camp for dinner and another evening by the campfire. 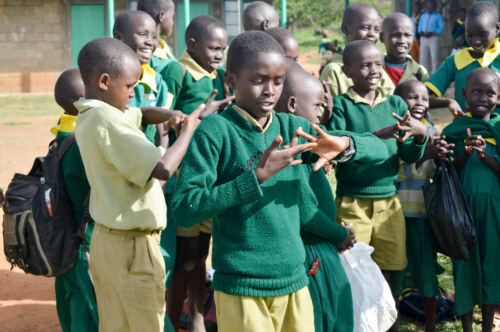 Students at Mpala Academy learning from TBI student Evan (photo credit: Ian Passe). 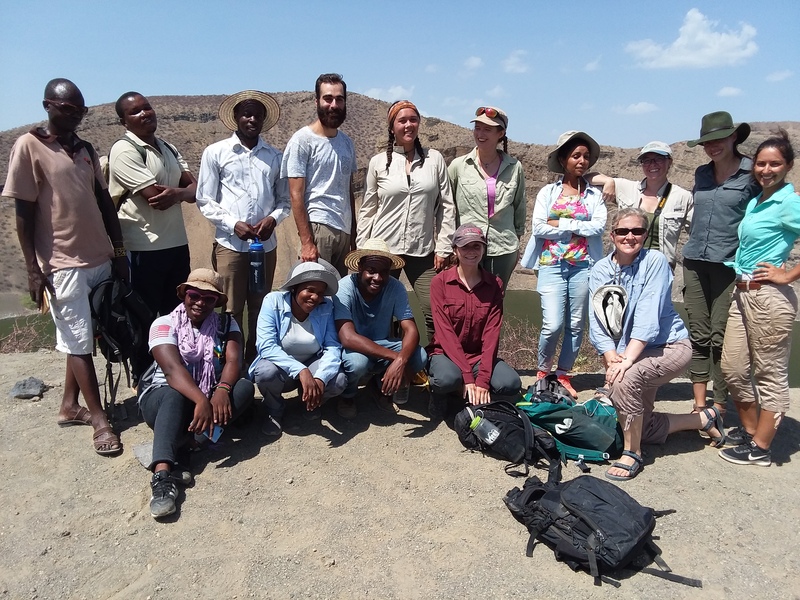 In our next update we will tell you a bit more about the classes the students have taken at Mpala, our flight up to Turkwel, and how we have adjusted to our life here in Turkana! 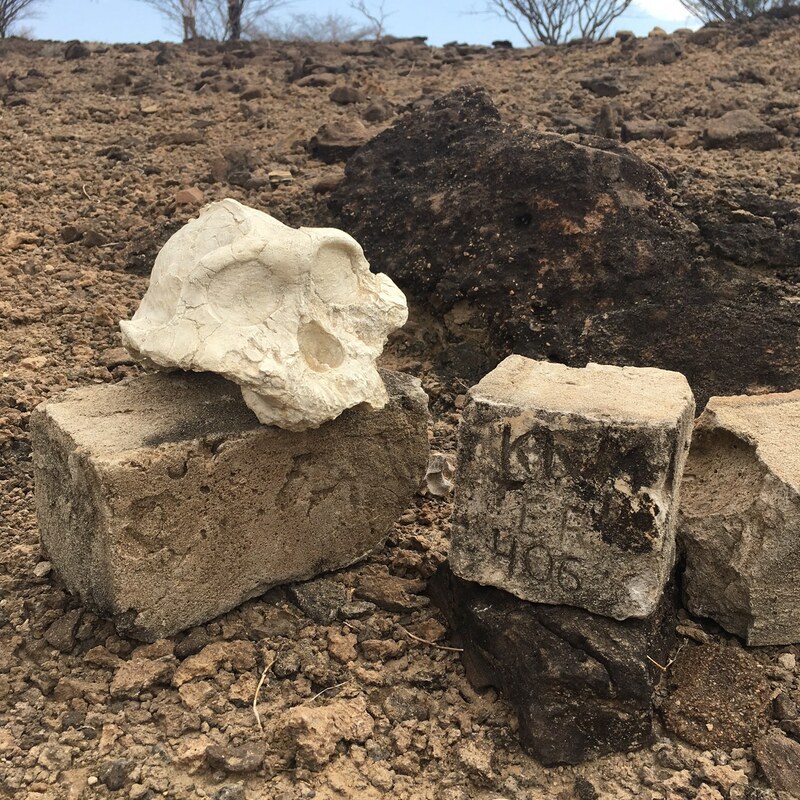 By Dr. Jason Lewis|2017-06-11T19:53:51-07:00June 10th, 2017|Field Schools, Origins Summer 2017, Origins Summer Field School|Comments Off on Origins Summer Program has begun! Hello! I'm Jason E. Lewis, Director of the TBI Origins Field School and a Research Assistant Professor at Stony Brook University. 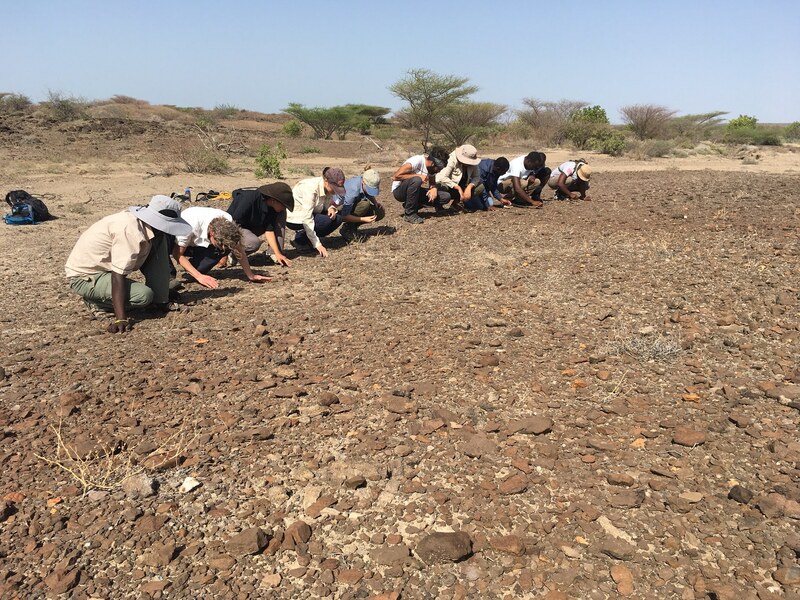 I am co-director of the West Turkana Archaeological Project and study the fossil animal remains from ancient archaeological sites to reconstruct the evolution, ecology, and behavior of our ancestors.